According to WhoWhatWear tucking your jeans into your boots is a thing of the past. Which I find slightly amusing as I have never really been big on tucking my jeans into my boots unless they were to the knee or over the knee boots...or unless they were my cowboy boots. I just never felt comfortable with ankle boots tucked in. There are just some jeans that aren't meant to be tucked in like boyfriend style jeans, cut off hems, or pants with zippers. I love untucked jeans with boots as it gives a look a more undone feel. Saturday the husband and I had to run some errands aka make a Target trip, so I wore my favorite sweater shirt from Aritzia and Loft boyfriend jeans. Super casual look for a super casual day. How do you wear your boots with jeans? I think I do a mix of both- sometimes I tuck my skinny jeans into my boots and sometimes I tuck them over, or cuff them. 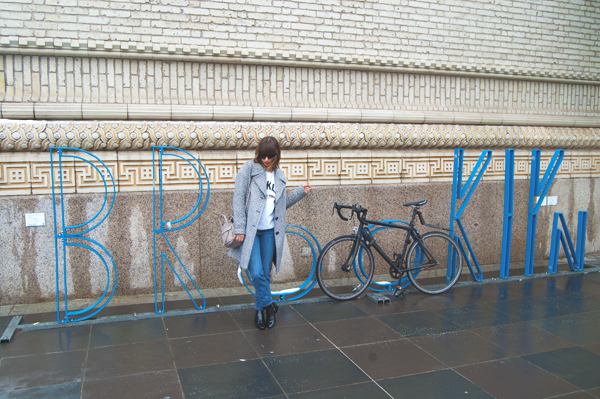 I like the way it looks untucked (and that cool Brooklyn sign in your pictures)! haha I love when they say trends are out and I'm like "What?! that was a thing?!" I don't like the idea of tucking jeans into booties. Glad you're enjoying your boyfriend jeans ;) Told you I could convert you!